When you think of researching a novel, what do you think of? For me, the first thing that comes to mind is the verifying of details – historical, biographical or geographical, for example. I imagine that depending on genre, there is more or less of this kind of research required. I suppose historical fiction writers to be at one end of the scale, and those who write fantasy at the other. I feel I sit somewhere in the middle. Most of what I write is imaginary and doesn’t need research as such, but there are a few elements that need to be checked to ensure they are accurate (I usually do this once the first draft is done). But I have discovered that for me at least there is also another kind of research: the sensory immersion into the the world I am describing. Seth: What’s that like? What’s it taste like? Describe it like Hemingway. Maggie: Well, it tastes like a pear. You don’t know what a pear tastes like? Seth: I don’t know what a pear tastes like to you. Maggie: Sweet, juicy, soft on your tongue, grainy like a sugary sand that dissolves in your mouth. How’s that? Although in The Night Rainbow the locations are imaginary, I spent hours and hours in the places that inspired them, soaking up the smells, the tastes, the sounds… I found the immersion in those elements vital to carrying the sense of place and the sense of character in the novel. In the novel I’m working on at the moment, I recently found that my imagination was only taking me so far. There was something tangible missing in my understanding of my protagonist. A large part of the story is set on a peniche – a house boat – and although I’ve seen plenty, and been onboard peniches converted into restaurants, pleasure boats and so on, it’s been twenty years since I was in an actual house boat, and that was on the Thames in Oxford, not on the Canal du Midi. I couldn’t feel it, smell it, hear it… I was longing to climb into the story and actually experience it through my character’s eyes. I was fortunate enough to find a friend of a friend who grew up on a peniche, and I recently arranged to meet her mother, to see if she could help. She took me to see her boat, and we spend a wonderful evening chatting about her experiences of life on the water. The stories and the way she recounted them details really helped bring my character to life. I began to feel him, much more intimately than before. This kind of ‘sensory research’ doesn’t need to be exotic, remote or expensive. I have great admiration for writers who can describe familiar places or situations in a way that makes the reader feel they are discovering it for the first time. Like the smell of a bonfire, or the taste of a pear. Can you remember a writer who has impressed you in that way? How do you balance the imaginary with ‘research’ in your writing? Great post. So often writers tumble over themselves to give us the visual, other senses are pushed to one side, to the detriment of immersion in that world. Smell in particular. I do find that poet/writers are often the best at the sensual details – Helen Dunmore, for example. At the beginning of The Siege, she describes leaves like a baby’s skin. I read the book and I loved it, grieved when it was over. That sense of tactile poignance never left me. “Leaves like a baby’s skin.” Wow, that’s such agile use of language, hats off to Helen Dunmore. Fantastic! And I am now picturing you dancing in your own private night club! or maybe it doesn’t matter? Maybe just the way s/he is enjoying eating it (draw on experiences of anything enjoyed), or grimly chomping through it, or irritated by the juice, or wondering what to do with the hard bit in the middle is all you need? Says lazily. 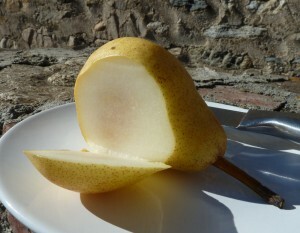 Pears are apples that have been parboiled and marinated in mud. Houseboats rock. Not ‘rock ya’, but roll in the water. Side to side; they have no keel. The toilets have to be pumped to flush and it (ew) all goes into a holding tank which must be emptied. The kitchen area will be like a caravan. Depending on your vintage, that can be Winnebago or gypsy. If you lean out of the window, you realise the water comes up to your waist. Sights, kingfisher — early morning. willow, any time. People, peering in through the windows in a way they would not if it were a house. Sometimes they are just checking their reflection in the windows. Lipstick. They are long and narrow and tricky to steer. Some of the passages are barely wider than the boat, and when two meet it has to be friendly; there’s no turning around in a canal. Aquaducts rock. As in ‘rock ya’. The one I saw was surprisingly swanky! I fell a little bit in love. I could happily live in one of those. Your blog post touches on what are some of the fundamentals of why people read and write fiction – and produce and enjoy art in a wider sense – which is an attempt to escape one’s own consciousness and to try to understand how the world is experienced by others. Great writing can do this – prompt the reader to consider things from a different perspective. I’d argue that’s a (perhaps unattainable) ambition for fiction too but great writers move the reader towards it – and it really does start with questions like ‘how do you describe a pear’. Yes absolutely, the same idea applies across the arts. I was thinking the same thing when I took the photo to go with the blog post as well. Such an interesting post, Claire. Your evening on the houseboat sounds like brilliant research. It’s not quite the same but I was people watching for 2 hours yesterday (hospital waiting room) and the way one boy in the room was relating to his mum gave me a whole new character and story idea for my next book. I think it’s important to absorb what is going on around you. Hi Rebecca! People watching is wonderful, I’m especially fond of railway stations for that. Characters just seem to mill around on the platform waiting to be chosen! Look forward to hearing about your next book! Interesting post. Sensory description is something my OU work has touched on. This is my favourite kind of research. I spent about a week in the bath for my current novel, trying to imagine myself immersed in water for the first time, searching for the right words to convey the sensory experience. Margaret Atwood’s pretty sharp on this kind of detail. I love a writer who can put you so firmly in the place (s)he’s describing that afterwards I’m not sure what’s my own memory and what’s fiction. That’s the kind of writer I want to be. Ooooh what an interesting post. 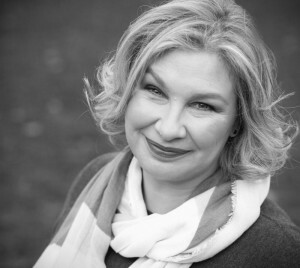 I would have to say that Bernadette Strachan is the author who impresses me most with her ability to totally immerse me in the scene she has written. The strangest thing is that I was resistant to reading her novels for ages as I thought they would be too ‘chick lit-y’ for me (I prefer reading crime novels). Thank you! I love it when I’m pleasantly surprised by an author I’ve had preconceptions about and read anyway!